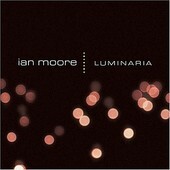 On his latest offering, and first for prominent indie Yep Roc, Seattle-by-way-of-Austin singer-songwriter Ian Moore's Luminaria is incredibly beautiful, a record that showcases his ability to gently fuse folk, pop, country, and even some rock into one harmonious sound. Album opener "What I've Done" gets right to the heart of the album, delivering one (of the many) gorgeous, laid-back, acoustic pop songs. This one stripped down to Moore's acoustic guitar and voice for a good portion of the song, an ambient guitar sound floating in the background, and some percussion adding dynamics to the song. "Caroline" adds more rock to the mix, the same polished pop and tenderness as "What I've Done", but this time with a more rock backdrop propelling Moore's soaring pop sensibilities and soothing voice. "Kangaroo Lake" finds Moore's voice leading the song, while a sparse acoustic guitar and light accompaniment - including an accordion and a cello - help flesh out the song, and giving it a roots-y feel. "Ordinary People" and "Cinnamon" are two more laid back, settled numbers that are equal parts folk and pop, with the pop (and Moore's keen sense of directing it) taking center stage, offering memorable numbers that will ingrain themselves deep in your psyche. "Sir Robert Scott" offers up a song that, not unlike the others, could find it tearing up the adult contemporary charts, while containing more emotions, more lyrical depth, and more glowing melodies than its contemporaries. Ian Moore's latest is a delicate, but balanced, fair-skinned pop-folk record that lends itself to indie-rockers and roots fans alike, a universal accessibility warming you up to the record, whatever your background is. The songs are enchanting, oft majestic, and led by the charming, charismatic voice of Ian Moore. I'll give it an A-.